ADI recently earned fifth place in the Elearning! Media Group’s (EMG) Learning! 100 Awards. The Learning! 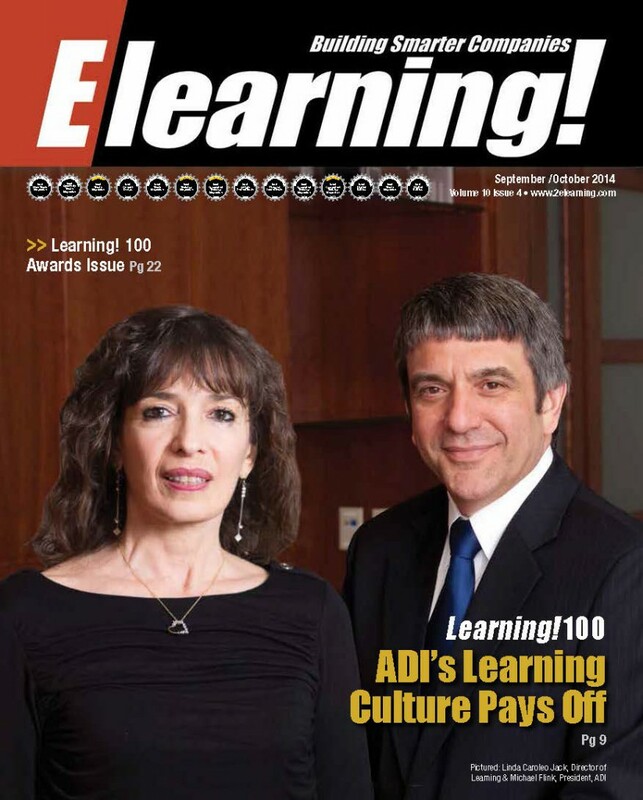 100 Awards recognize excellence in learning across enterprises that invest in a truly immersive learning culture. The Learning! 100 Awards were presented at the Annual Learning! 100 Awards Dinner & Reception held last month and honored the top global 100 learning organizations across private and public sectors. ADI was selected for building a first-rate employee training program through its ADI University, and transforming the organization into a learning culture. Learning! 100 applicants were evaluated in criterion focusing on learning cultures, collaborative strategies’ innovation and collaboration, and overall organization performance. Click here to access Elearning Magazine to read the full article. You will find information about ADI on pages 39 and 45. As a leading distributor, ADI is a large organization that moves at a very fast pace. With so many new products and technologies becoming available it can get difficult to keep our sales professionals up-to-date to support all the technologies we offer. We want our sales team to serve as a valuable resource to our customers, and understand that we need to give them the right tools to do so. In order to continue providing the best service and experience to our customers and invest in the long term future of ADI, we invested in the education of our staff. And that is why we developed the ADI University, and transformed into a learning culture at ADI. The first step we took in building a world-class learning culture was hiring an experienced director to lead the initiative and help define the goals of the program, key objectives, and determine the best way to engage employees and track results. ADI University offers a blended learning approach using eLearning, web instructor-led, industry certification training, and mentoring opportunities. Through our online portal, our sales staff has easy access to training programs that are personalized for them and we can measure and track results. Our training team collaborates with product management, sales and support to deliver quality content that is relevant and engaging for our sales employees. Our leadership team spends time coaching the sales staff, and reinforcing the concepts learned in the courseware. ADI University has been well received by our sales people, and more customers are depending on our team to help with product selection and as a resource to the latest technologies. By providing our team with a strong training and education foundation, we are helping them better serve our dealers and deliver an exceptional customer experience. Since so many of our customers have been asking how they can get involved, we are working on making the training available to dealers with the launch of our ADI Academy training program. ADI Academy will consist of online training modules that provide general product knowledge across all the major categories. The ADI Academy will present an excellent training opportunity for sales, operations and corporate staff. Stay tuned for more information.